Update: The latest version of Adapter for Mac OS X is free. Download here. The struggle is real! Somehow you inherited a WMA (Windows Media Audio File) file but you can’t play it or convert in iTunes. WMA is a depreciating audio file format that is proprietary to Microsoft. The format uses licensing, so converting a WMA file without rights may be illegal. 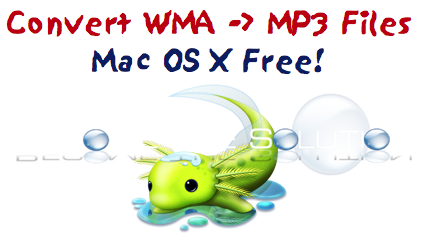 Luckily, there is an easy way to quickly convert WMA files on Mac X. 1. Download and install All2MP3 located here. Note: At the time of this post, the above installer also installs other applications as part of their package – including Yahoo Powered Search and PremierOpinion which you can safely trash from your applications folder afterowrds. Also, it will set your browsers homepage to yahoo search default – so change that there too – it may also install a yahoo extension in your browser(s). 2. Once installed, open the All2MP3.app. 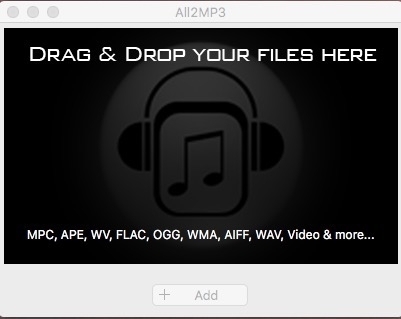 You can drag and drop your WMA files to the All2MP3 window and hit convert. ALL2MP3 is not fully compatible with Windows Media Format, some files will not be converted. 4. Rest assured, ALL2MP3 will convert the files fine. Let the app run. It will take some time to convert each file depending on the size. It may seem the app isn’t working, but you will notice the countdown of files lessen after each successful WMA conversion. 5. 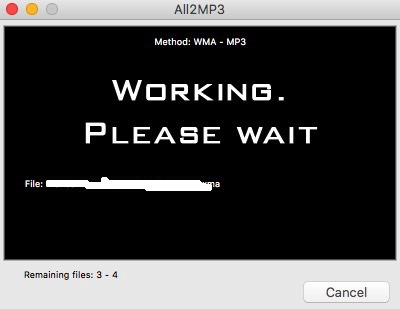 Enjoy your newly converted WMA to MP3 files!